This installment to the yearbook collection is pretty much the exact opposite of the last. Shurtleff College, also known as Southern Illinois University-Edwardsville, has a great online archive of their yearbooks. Unlike my last entry I had zero intrest in Shurtleff College's football history until I cracked open these yearbooks, nor did I even recognize the school by name. Another difference between this entry on Shurtleff and the last post regarding Delaware's yearbooks - is that this collection is searchable and a total pleasure to look at online. Southern Illinois University-Edwardsville's yearbook is the Muse and SIUE's precursor, Shurtleff College's yearbook is the Retrospect. 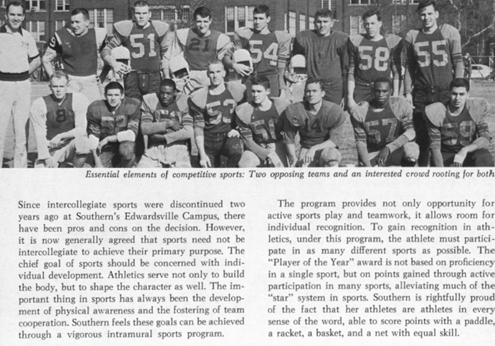 Shurtleff college played football, but folded in 1957 SIUE took over the Shurtleff campus and de-emphasised intercollegiate athletics and chose to subsidize intramural sports instead. 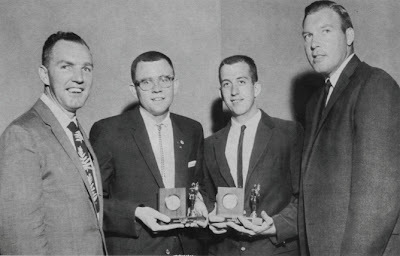 Additionally, after the move away from intercollegiate athletics, the school's player of the year honors were given not for athletic excellence, but for overall athletic participation. In any era that was a truly novel idea for an athletic department. You can read a little bit more about the schools and yearbooks here. The retrospect was published for years: 1911-1932, 1938-1942, and 1948-1956. These are a great collection of yearbooks and the search function is accurate across collections and within individual yearbooks.